At Tim Hortons, we aim to consider the environment when making packaging decisions. 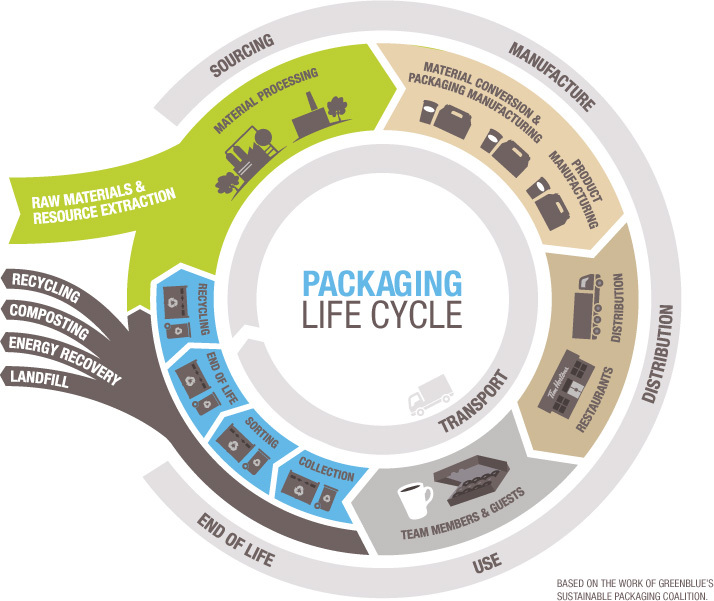 Designing better packaging can significantly reduce adverse environmental impacts. 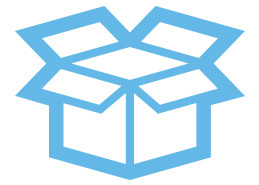 Examples of how we do this includes reducing material, resizing and reconfiguring for pallet optimization, increasing recycled content, and using new material types and sources. In 2014, we continued pallet optimization efforts, in order to reduce the environmental impacts associated with transporting our products and reduce the amount of packaging. We targeted product, both food and packaging items, arriving at our Distribution Centres with the goal of reducing the total number of incoming pallets. We executed two projects focused on our cold beverage lids by testing and adding one additional layer to each of these pallet configurations. Our new pallet patterns were able to decrease the number of incoming pallets by over 3,900 in 2014. This initiative increased product per pallet by 33%, which in turn increased our truckload weight utilization by approximately 29%. As we strive to reduce the waste created in our business, one of the most important areas of action is tackling the waste generated at our restaurants. We work towards this objective by considering the environment when designing our packaging as well as by implementing reduction, reuse and recycling initiatives in our restaurants. Annual waste audits provide us with insights about each type of waste that is generated, including how guests and Team Members sort waste at our restaurants. During these audits, all waste generated at a particular restaurant is analyzed to determine whether it can be reduced, reused or recycled. 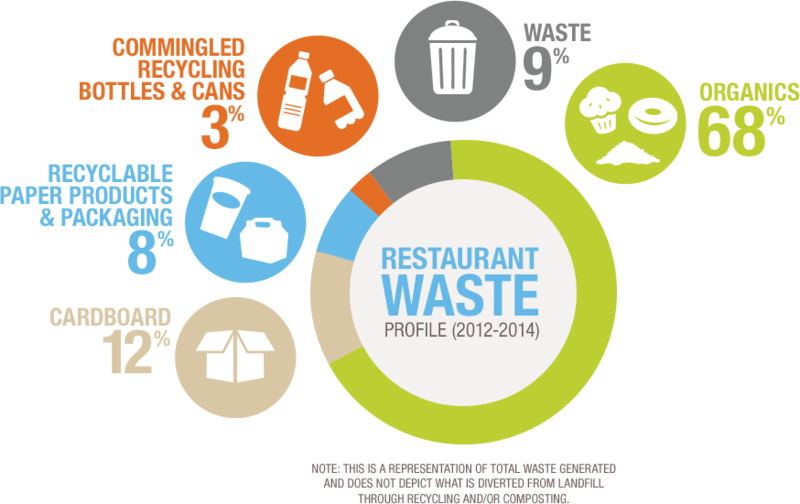 The following chart represents the average proportion of waste (by weight and type of material) generated at a standard Tim Hortons restaurant, based on the annual waste audits conducted since 2012. While recycling and composting are great solutions for waste, reducing waste through reuse and improved processes can have greater benefits. We continue to encourage our guests to use ceramic mugs, plates and bowls when dining in our restaurants, and guests are also provided with a 10 cent discount when they bring in their own travel mug for hot beverage refills. In instances where packaging and other waste cannot be reduced or avoided, we are committed to working together with Restaurant Owners to increase access to programs that divert these materials from landfill. These include recycling programs for cardboard, beverage containers (bottles and cans) and paper packaging, including our hot beverage cup. We are also working with Restaurant Owners to increase the number of restaurants participating in composting programs for coffee grounds and food waste. Our waste diversion programs vary between restaurants because they are located in different regions with different levels of access to recycling and organic waste services. Our Restaurant Owners also use different waste management service providers, which also impacts the items accepted in recycling programs. In order to accommodate for regional variations and each restaurant’s unique diversion programs, our multi-stream recycling unit was developed to allow for varied signage to be displayed. These units can be used for bottle and can recycling programs at the outset, but as services for recycling and composting become more widely available the unit can evolve with new educational signage. 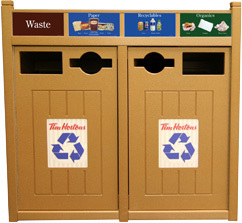 Tim Hortons is committed to moving forward to improve access to diversion programs for our waste materials. Two materials that we have been particularly focused on diverting from landfill are organics and hot beverage cups. In 2012, we set a goal to increase the number of restaurants diverting organic materials and paper packaging from landfill by 20% by 2016 (based on a 2011 baseline). Organic materials, coffee grounds and food waste, are the most significant portion of our waste stream (by weight) and they have potential beneficial properties as soil amendments and for power generation. Paper packaging diversion programs target our hot beverage cup and the paper packaging used for food items. Recycling and composting programs for hot beverage cups is of particular importance to our guests and is part of delivering the ultimate guest experience in our restaurants. To measure our progress against our goal, in 2013 we conducted a survey with all restaurants in our chain. The survey found that 16% of respondents indicated they had diversion programs in place for organic materials, which represents a 27% increase in the number of restaurants since 2011. Similarly, the survey respondents indicated that paper packaging diversion programs were offered at 30% of our restaurants in Canada, which represents a 34% increase when compared to the 2011 baseline. While we reached our goal in advance of 2016, we continue to look for new opportunities to increase the number of restaurants with programs to divert the full range of our waste materials from landfill. We continue to work with various partners to identify new waste service providers and to improve equipment and processes for our Restaurant Owners. At the same time, we continued our work on a comprehensive waste diversion strategy for our restaurant system. In 2014, we started discussions with our Restaurant Owners in key regions to support the first phase of our strategy. In 2015, we aim to pilot the strategy in these key regions. When we first started looking for end-of-life solutions for our hot beverage cups, it was unknown as to whether our cup could be recycled. Through work with waste industry experts and mill trials, we now know that our hot beverage cups can be successfully recycled. Our current challenge is the accessibility of recycling programs that accept and process our hot beverage cups, both for our restaurants as well as for our guests, through household recycling systems. In order to increase access to recycling programs for our hot beverage cup, we are working with organizations such as Stewardship Ontario to collaborate with municipalities and demonstrate that our cups can be recycled without compromising current recycling programs. Some solutions can be very low-tech and immediate, while others may involve some investment. The collaborative work with these organizations is helping to increase the recycling community’s knowledge of effective diversion of hot beverage cups. In 2014, we continued our work with Stewardship Ontario and the Carton Council of Canada to explore the barriers to expanding the collection, sorting, and marketing of the current post-consumer carton material classification to include other compatible composite paper packaging materials (such as hot beverage paper cups, fibre-based ice cream cartons and fibre-based freezer packaging). This work progressed through two initial phases; trials at recycling facilities and tests at a paper mill. These projects identified next steps, including the need to review sorting technologies at recycling facilities and the continued need for paper mill trials for the broader composite paper packaging category. More work is planned in 2015 to move forward with the next steps. Our progress on waste reduction and diversion is only possible through the participation of our guests. To help us reduce waste, bring in your travel mug to receive a 10 cent discount on hot beverage refills and request the use of reusable ceramic dishware when eating in our restaurants. 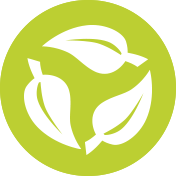 As our guest, you are also the key to ensuring that our recycling and composting programs are successful. By disposing of items properly, you help to reduce the amount of waste that goes to landfill. When items are placed in the wrong waste container, it can compromise our ability to recycle and/or compost your packaging. Programs vary by restaurant, so please take a moment to look at the signage before disposing of your waste. We look for new ways to engage and educate our guests through promotional messages in-restaurant and in neighbouring communities. We support litter prevention through messaging on our packaging such as “Please Put Waste in Its Place,” and the majority of our restaurants also post a “Be a Good Neighbour, Don’t Litter” message at the exit of their drive-thrus. Our support for Community Clean-Ups and Litter Awareness campaigns is an example of how we encourage our guests and communities to participate in diversion programs to keep our neighbourhoods clean. In April 2014, 1,939 of our restaurants participated in the Anti-Litter Awareness Program. Our Restaurants have also taken a leadership role by supporting local community clean-up initiatives in partnership with municipalities, schools and local community groups. In 2014, our Restaurant Owners supported 650 local community clean-ups across Canada. In an effort to increase knowledge about the environmental impact of our packaging designs and to increase the availability of recycling programs for our packaging, we continue to collaborate with the food service/quick service restaurant industry peers, as well as members of the waste management industry. In 2014, we continued to be active members of the Food Service Packaging Institute’s Paper Recovery Alliance and the Sustainable Packaging Coalition (SPC). We also worked with the Recycling Council of Ontario as a member of the board of directors. These groups share our commitment to improving end-of-life solutions for packaging, and reducing the environmental impact of packaging designs. 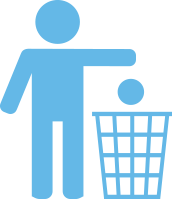 These forums also give us an opportunity to engage with our peers in meaningful discussion and initiatives concerning packaging. We will continue to collaborate with stakeholders who share our commitment to reducing the environmental impact of the materials we source, as well as diverting waste from landfill. Tim Hortons contributes funds to mandatory packaging stewardship programs in Ontario, Quebec, British Columbia and Manitoba. These programs help to finance municipal recycling programs in the respective regions. Fees are paid on packaging and paper materials that may enter municipal recycling programs, regardless of whether they are actually collected and managed by the programs. This includes all of our Tim Hortons branded packaging, such as our hot beverage cups. In addition to funds contributed to these programs, we are also active participants in the programs as they work to increase recycling rates for various materials and harmonize program elements. 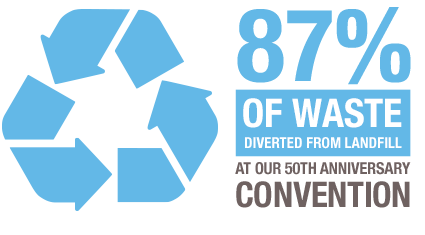 In 2014, we worked with Stewardship Ontario both as a member of the board of directors and research partner to increase diversion of hot beverage cups in municipal Blue Box programs. We also supported Canadian Steward Services Alliance as a board member working towards national recycling program standards and benchmarks. We evaluate new technology, design and construction methods to improve the energy and water efficiency of our restaurant buildings. This also enables our Restaurant Owners to benefit financially by saving on the utility costs to operate their restaurants. We pilot and test emerging technologies and, where feasible, introduce them into our standard restaurant designs. Is it cost effective? Up-front costs may sometimes be higher but yield significant payback over time. Is it repeatable? New technologies often require other changes to the restaurants that aren’t feasible for us. Will it work? Many ideas work well in residential or large commercial developments but don’t meet our needs. LED lighting was standard in all new restaurants and renovations throughout 2014. The new lighting package reduces lighting energy consumption by up to 60%. Owners are also able to upgrade existing restaurants through a lighting retrofit program. To further increase energy reduction we introduced daylighting and occupancy controls as standard across the franchise. In addition to LED lighting retrofits, the Building Standards team is working to help reduce energy consumption for existing restaurants, introducing retrofit products like glass coating to reduce energy loss through windows by up to 40%. The LEED rating systems provide a strong framework for improving building performance and occupant wellbeing with our LEED restaurants seeing an average water and energy reduction of 10%–15% over other restaurants. However, we will continue to review the overall costs and benefits of pursuing LEED certification through the review of our Sustainability & Responsibility Strategy. In 2014, over 200 of our restaurants in Ontario underwent renovations that included energy-saving measures. These measures contributed to a projected post-renovation annual energy savings of 18,133 kilowatt-hours (kWh) for a standard 2,500 square-foot restaurant. 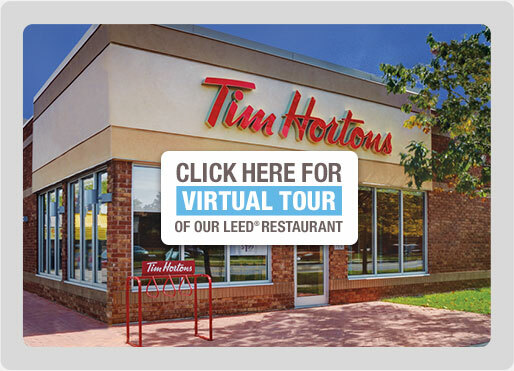 Tim Hortons achieved energy savings of approximately four million kWh province-wide by December 31, 2014, which is comparable to the amount of electricity it would take to power about 420 homes for one year. Compared to our restaurant operations and distribution fleet, the environmental footprint of our corporate offices is minor. However, in an effort to improve the environmental footprint in all areas of our business that we have direct influence, our Corporate Facilities Team has continually focused on making our corporate buildings more energy and water efficient. 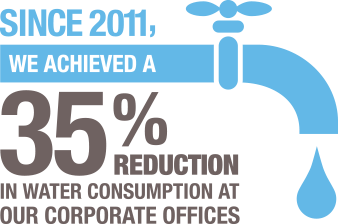 In 2012, we set a goal to reduce our energy and water use at our corporate offices by 10% by the end of 2014, as compared to 2011 consumption. At the end of 2013, we had met our goal for water usage, achieving a 35% reduction in water consumption. While we were able to decrease our overall electricity consumption by 1%, our overall energy consumption increased by 10% as a result of the increase in natural gas consumption in early 2014 due to the extremely low temperatures. In 2014 at our Head Office in Oakville, we replaced 18 roof top HVAC units with high efficiency units, which is expected to reduce energy consumption going forward. Water savings were primarily the result of limited irrigation of green spaces during the summer months outside our Head Office, which is the largest consumer of water for all corporate offices. We also replaced all irrigation sprinkler heads with low flow heads and upgraded the irrigation controllers to include rain sensors. Shredding & recycling of fine paper. We have also introduced select recycling programs for electronics, fluorescent lights and batteries. In 2014, we celebrated our waste diversion programs with employees during Waste Reduction Week and hosted two community clean-ups. Using waste audit data, we also identified waste reduction opportunities and key program improvements that will be used as we develop next steps for corporate waste diversion. We also re-evaluated our corporate waste data and made efforts to standardize the way waste is measured across the business, including distribution centres and manufacturing facilities. 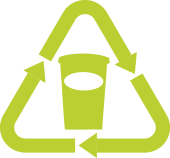 For more information about our waste diversion rate, please see Our Environmental Footprint and Performance section here. Beyond the waste programs at our Corporate Head Office buildings, we also made best efforts to limit the environmental impacts associated with Tim Hortons 50th Anniversary Convention which ran from July 16-20 2014 at the Metro Toronto Convention Centre (MTCC). Our convention brought together over 2500 Restaurant Owners, their families, corporate staff and suppliers for celebratory events, business sessions, and supplier exhibits. The exhibit hall contained a “Restaurant of the Future” which had many sustainability aspects integrated into the design. Our Restaurant Owners were given personal tablets for scheduling and communications to reduce paper waste. Scheduled bus transportation from hotels to the events also reduced multi-vehicle use and traffic congestion. We also worked with the MTCC to reach an 87% waste diversion rate. We also donated over 12,500 lbs of food to Second Harvest and other community partners. Lastly, we planted over 1500 trees across our 6 Tim Hortons Children’s Foundation camps to help reduce the environmental impact of our convention activities. Restaurant Owners and campers volunteered their time to celebrate our past and look forward to the future though tree planting. The trees symbolize our commitment to sustainability and will leave an environmental legacy for generations to come. We called this initiative our 50th Year Forest. In their lifetime, the trees in our 50th Year Forest should eliminate 440 tonnes of CO2e. In 2014, we continued our partnership Smart Commute Halton for the fourth year to encourage our Head Office employees to consider smart travel options such as walking, cycling, transit, and carpooling. This year Tim Hortons was awarded the 2014 Smart Commute Silver Workplace Award – which is awarded to workplaces that take the program beyond the basics to make a significant positive impact. In 2014, both our coffee roasting plants, in Hamilton, ON, and Rochester, NY, continued to focus on reducing their waste to landfill. In addition to recycling their cardboard, plastic wrap and jute bags (bags that held green coffee), our Hamilton plant is now diverting coffee chaff, the outer skin of the coffee bean, from landfill. Fruition Fruits & Fills (Fruition) is our manufacturing facility that produces our fondants, fills, icings, and ready-to-use glaze that are used on a number of our baked good products, and the syrups used to make our Fruit Smoothies. 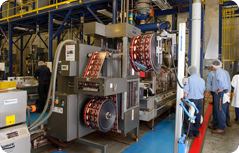 The production of icing and fruit-based filling and glaze has typically been water intensive. Therefore, in past years, Fruition has focused on reducing the amount of water used in its manufacturing process. 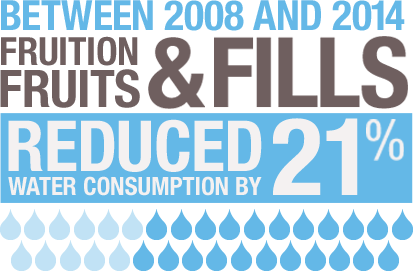 Between 2011 and 2014, we have reduced our water consumption by 21%. Our focus in 2014 was on reducing waste and improving waste diversion rates. This was done through efforts to educate employees on the importance of reducing waste and segregating materials into the appropriate waste stream. Through these efforts and previous years’ activities, we maintained a waste diversion rate of 89% at Fruition. Fuel consumption in our distribution operation represents the most significant contributor to our carbon footprint and we are focused on increasing the efficiency of this part of our business to reduce our impact. For more information, please see Our Environmental Footprint and Performance section here. By integrating our restaurant delivery empty return trips with our inbound vendor deliveries we avoided 4,383 shipments, resulting in 540 tonnes of reduced carbon emissions. We continue to expand this initiative by strategically linking our returning drivers with inbound bulk goods to our Distribution Centres. Our cases per km also remained the same in 2014 when compared to 2013, despite significant growth in servicing non-traditional restaurants. Our non-traditional restaurants require an increased number of lower case deliveries because they have less space for storage than our standard restaurants. “Truck Cube Optimization” is our indicator of how much inventory we are getting on each truck, which increased by 1.7% from 2013. 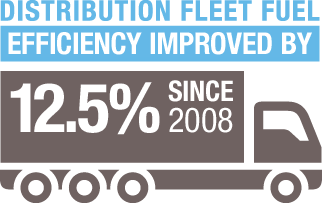 By continuing our focus on equipment technology, driver behavior and efficient business practices we remain committed to further fuel efficiency improvement.